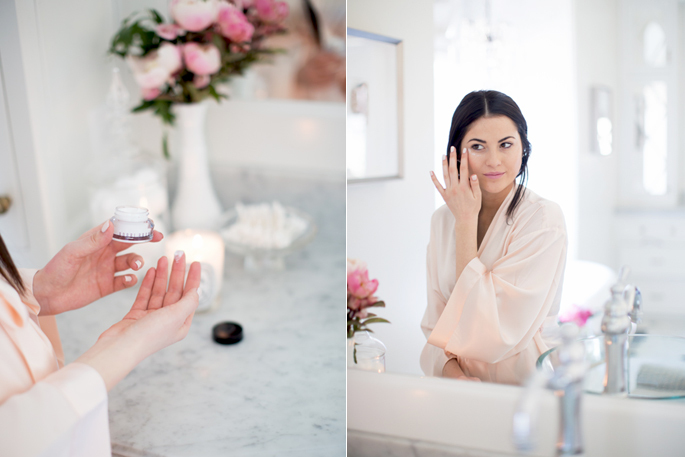 Today I’m excited to be teaming up with Nordstrom to share with you my daily skin care routine. I’ve had a ton of questions regarding my skin care so this post is long over-due! 1. I apply Kiehl’s Creme de Corps to my body right after I shower, that way by the time my hair and makeup are done, the lotion has absorbed and doesn’t get all over my clothes. 2. I wash my face with the Cetaphil Gentle Skin Cleanser. 3. I apply Créme de La Mer to my face and neck (in my opinion this moisturizer is worth of every penny, It’s the only one I’ve used that hasn’t made my face oily or breakout). 4. I apply Laura Mercier Primer to my face before I put my foundation on. A primer is important because your foundation will sit on top of the primer instead of absorbing into your pores, it’s like a protective shield for your face. I’ve noticed the biggest difference in my skin since using a primer! 1. I apply Kiehl’s Creme de Corps to my stomach (I typically don’t moisturize my body before bed but since I’m pregnant I’ve been putting it on my stomach). 2. 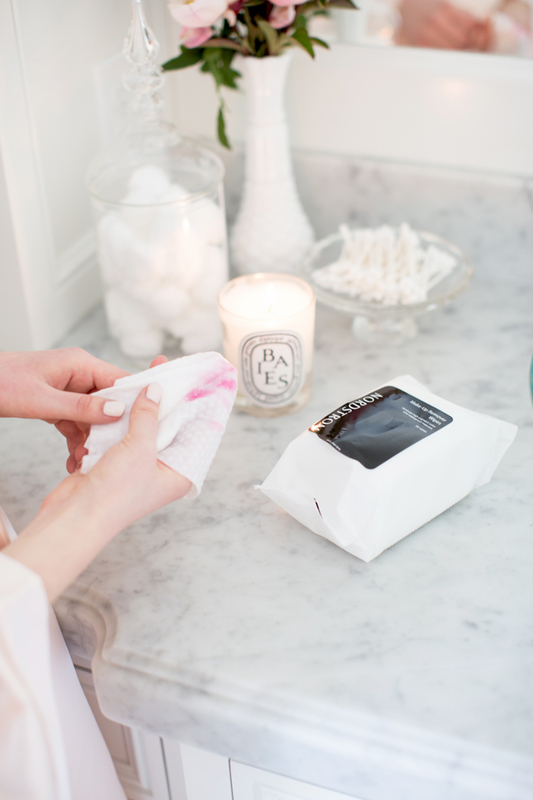 I remove my eye makeup and any lipstick with make-up remover wipes. 3. I wash my face and neck with my cleanser and Clarisonic Mia. 4. I apply Estée Lauder Advanced Night Serum to my face and neck. (I brush my teeth right after to give it time to absorb into my skin before I moisturize). 5. I apply Crème de la Mer to my face and neck. 6. I apply Bobbi Brown Hydrating Eye Cream all around my my eyes. LaMer’s moisturizing cream and Estee Lauder’s Advanced Night repair serum are my two holy grails! Pure love with this post ! I really love it ! I also use Clarisonic. Creme de la Mer is quite expensive so I have no experience with it. You looks so beautiful without any makeup! These products look really interesting, I would really lke to try the Clarisonic! 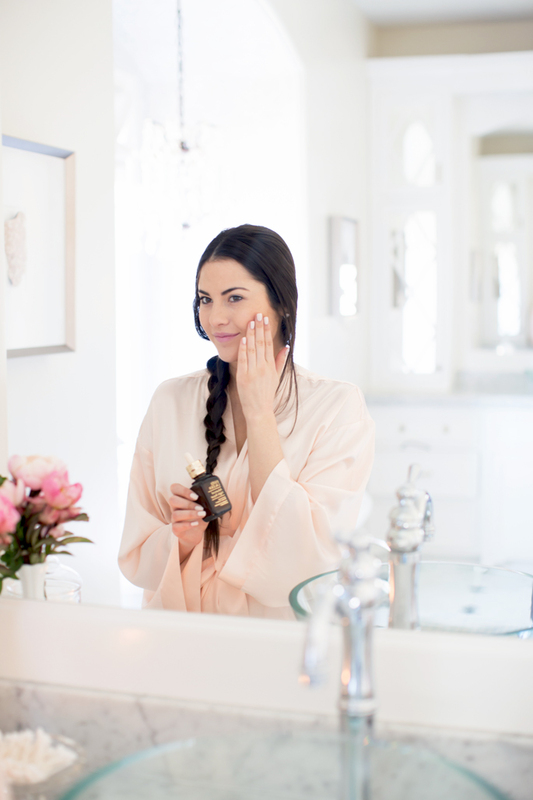 The Advanced Night Repair Serum is one of my favorite products! Love learning about new skin care products! That La Mer cream sounds amazing. This routine makes my skin feel clean and smooth already. Thanks for sharing! Whatever happened to dove, biore, and jergens? It seems there’s always a new “fave” with you. Be honest, what do you actually use? I guess this post is more accurate, since each product put together is more than most people’s monthly salaries. Thanks for the question. Dove is a product I have used on my body in the shower for years like I said in my post. I also have used Jergens since high school but only during the spring and summer to help enhance my tan, I wouldn’t consider that particular product apart of my nightly and daily skin care routine so I didn’t include it here. I am lucky enough to be given amazing new products to test out and try, like Biore. I always give them a try before I review them and if I don’t like the product I turn the review post down. Great job at replying without feeding the haters! I swear by Estee Lauder’s Advanced Night Repair. I also love Essie Fiji, though it’s a bugger to apply!!!! Your bathroom looks gorgeous Rach I love the marble/granite you’ve used. Love reading about others skin care routine! LeMar is amazing! Very nice products! 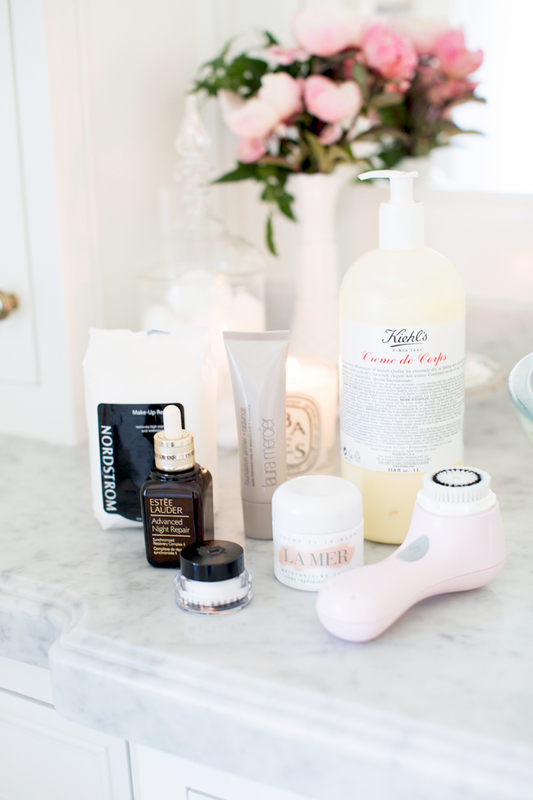 I also use the Clarisonic, I even wrote a post about it last august, you can read it here http://fedefashionandcupcakes.blogspot.it/2014/08/beauty-routine.html. I’m looking for a good night serum. PS. new handbags post on my blog! Just wondering which drugstore cleaners do you use? @ Jill @ Champagne for Everyday Clarisonic has various brushes for all skin types. There is one for sensitive skin that would be great for you. I have very sensitive skin but use the Clarisonic every day and night with no problems. Clarisonic really is one beauty product everyone should invest in. I bought mine years ago and never have had any problems with it. Plus if you don’t like it or it reacts to your face, you can always return it, even after using it. I use clarisonic deep pore cleanser with the brush and love it. That Kiehl’s cream is the best!! What face wash do you use from the drugstore? LOVE LOVE LOVE LaMer! I agree, worth every penny. I love Kiehl’s products! They are amazing and never irritate my skin! First, thanks for being honest and saying that you use a drugstore cleanser. I think a lot of times certain items like cleansers that just get washed down the drain aren’t worth the money. I use an all-natural one that I just love with my Clarisonic instead of the one that comes with it. Great routine! I love Kiehl’s! I have their deep pore cleanser and it’s the best!! Love the robe, it perfectly matches all of these amazing products! I’m so happy you finally posted your skin care routine! Can you tell me what your routine is like after a day in the sun? I am preparing for a trip to Bora Bora and would love to know if there are any products your recommend for the sun! Love that bathroom! And your robe is gorgeous as well. I love seeing other peoples skin car routine! What color nail polish are you wearing? So pretty! Love love love La Mer. I have been using it for about three weeks and can see a difference in my skin already! You are a natural beaut!! I love La Mer and its been great during pregnancy since its a super safe moisturizer. Wow I love this Rach!! I am 14 weeks pregnant and understand how important a daily routine is! I used the pink Olay Pro X brush on my face which you can buy online or at some special stores. They usually have the boring white brushes at stores. LOVE my Clarisonic! Best skin tool ever! I need to try that Kiehl’s creme. Thanks for sharing! Great tips! I’ve heard great things about Kiehls…definitely going to try it out! Yes they totally do! That’s what I did before I made the splurge. It lasted me about a week! Thanks for sharing! I’ve wondered what products you use because your skin always looks perfect! I have thought of trying LaMer ((don’t tell my husband!!)) but found a line I really like. It’s called Eminence and all the ingredients are organic— love it! Hello! I am really interested in the La Mer moisturizer, however I have known that it ismoisturizer is oily. But you said that it doesn’t make you break out or oily, do you have dry skin, oily or combo? And will you recommend this one over the Charlotte Tilbury one? I really love your blog by the way. Thank you! Great products, I will have to try some!! didn’t know Nordstrom made face wipes! might have to try these out! btw, love that flower arrangement! I’ve been wanting to try the Clarisonic! I’ve only heard great things about it! I really want to try La Mer! Just wish it wasn’t so expensive. You look so lovely and elegant in these photos! All 5 star products Rachel! Thank you for sharing! I’m seeing the estee lauder night serum everywhere right now,so it seems to be quite a useful product :) I might give it a try once I’m changing my nighttime routine. And Kiehls definitely makes one of the best lotions around, I love their ultra facial cream so much. I am getting that primer. Thanks for the reviews! Hey Rachel! You look absolutely glowing in that beautiful blush robe. Thanks for sharing your skincare tips! I think the Bobbi Brown eye cream is the best one too. I have always wanted to try that clarisonic brush. That is a good idea to let the serum soak in before putting on night cream. I’ll have to try that. Thanks for the tips! All great products and a terrific post. Just a work of caution, however. You may want to consider switching products while pregnant. Many anti-aging products contain ingredients that can harm your unborn child. Good luck and congratulations! Thanks for sharing! My skin care routine is so boring compared to yours. I love Creme de al Mer, but it’s soooo pricy. Do you have any suggestions for a more affordable dupe? Love my clarisonic too – I’ve noticed the biggest difference. 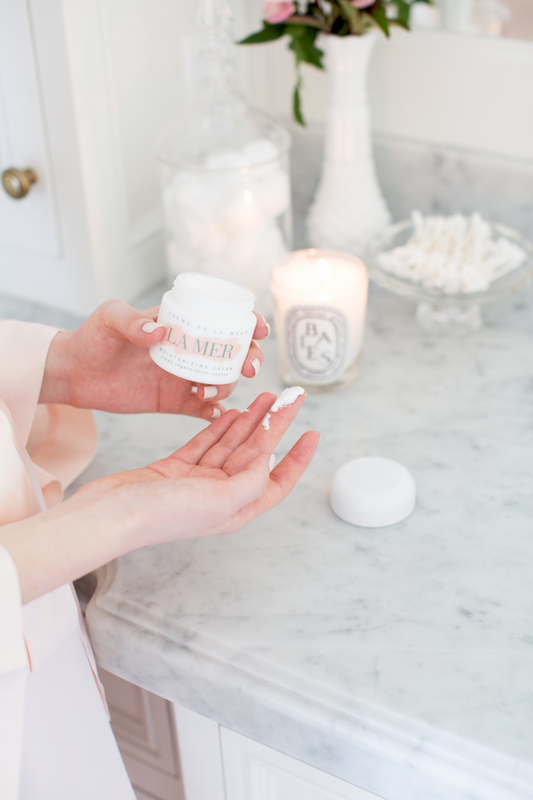 Thanks for sharing these tips – I’m excited to try la Mer. The robe is adorable too! Thanks for sharing! I need a new hydrating eye cream. Just finished my Clarin’s tube. Does yours help repair & prevent wrinkles? 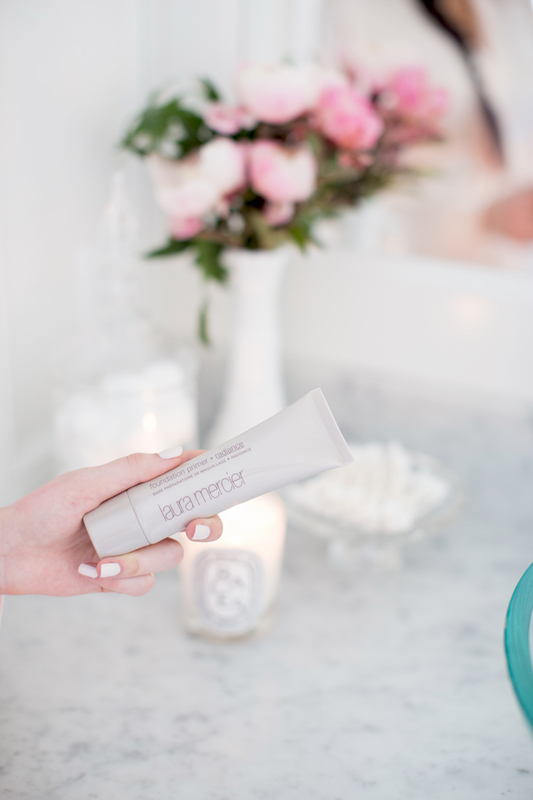 I love the Laura Mercier primer.. I use it everyday! I love hearing about your skin routin! You have gogeous skin’s. I have bean using Laura Merciers primer for quite some time now and I donut now how I really ever lived without it!!! It makes my makup looked soooo amazefest! You are gogeous rachel!!!!! Great post! What foundation and foundation color do you use? I heard such amazing things about that serum, I’m contemplating giving it a try. Your robe is so cute! Happy Friday, Rach! Will you be doing a future post on your daily haircare routine?! La Mer is my favorite!! I use many of their products. A friend of mine saw you in person this past weekend and overheard a conversation where you were being completely racist!!! Apparently you have an issue with people who speak Arabic? Have some class! I typically try my best to ignore negative comments and let them roll off my back but I take great offense in you calling me racist. I’ve never in my life had a conversation talking about anyone who speaks Arabic or any other language for that matter. Your friend has misinformed you. How can you claim a product is “worth of [sic] every penny” when you don’t actually pay for the product? Hey Rachel do you have an oily skin type or normal skin type? Got all of the face samples today to try. Already had a clarasonic, but it’s makeing me breakout. :( I agree with someone above who asked if there was a cheaper comparable version of the LM face cream. I can’t afford that in my wildest dreams! Yes try the Charlotte Tilbury magic cream! For me, It’s a close second and a lot of people like it better. Thank you so much! Your photos are gorgeous! @Megan, Be patient with the Clarisonic as it is suppose to make you break out at first. It is bringing everything out to the surface. All of that will go away and you will have pretty, smooth skin. You are suppose to give stuff like that 3-6 month try. I’ve been wanting to try La Mer for a few years now and finally broke down and got me some last month. I got the original but exchanged it because it was just too thick. I got the soft cream instead and loooove it. It’s the one thing I’ve used which has actually made a difference within a week of wearing it. Thanks for your reviews. Forget the naysayers, you’re doing great. I’m not sure if you should use the Clarisonic during your pregnancy due to ultrasound so you better consult this with someone. Love your robe! You are absolutely stunning! The pics are amazing. I love how you laid it out. I am a huge fan of the Clarisonic I Probably couldn’t survive the winter without mine! Hope you’re having a fab weekend! So many great products!! I love that khiel’s moisturizer and the Bobbi Brown eye cream. I haven’t tried La Mer, but would love to!! I keep hearing about Clarisonic Mia and how great it is but I ‘ve never gave it try. Such great picks! I love the Estee Lauder Night Recovery as well and would also highly recommend the Khiel’s Avocado eye treatment, it’s the best eye cream I’ve used! I’ve been searching for new products to try so this came at the perfect time! Thank you so much for sharing- I have the same skin type so most of the products you have recommended that I have tried work great for me as well! Also, I just wanted to add that I love your blog and am always inspired by your creativity and hard work. I know there are a lot of haters out there, and just wanted to send you a reminder that there are a lot of people who love what you do too! You look so cute with that sweet little baby bump! Thanks for sharing your routine. It seems real solid. My only suggestion would be to try using a flat makeup brush to apply La Mer. I was told by a dermatologist that its best not to you use your fingers when moisturizing your face because of the inherent oils in your fingers. Also it best to let the moisturizer absorb slowly. You will find that it takes longer for the moisturizer to disappear and it feels cool going on. If you use a moisturizer that has oxygen in it it really shouldn’t have contact with the skin on your fingers. Enjoy the rest of your pregnancy. Its really a special time. Love the robe! I was going to ask what cleanser you use but see you use Cetaphil. Great staple cleanser. Do you notice a difference using the Clarisonic? I love the Post of the Day. It’s so Important to have a Great Skin. I have the Same Este Lauder crem and Love it. Great post! Are all safe for pregnancy? Hi! How about sunscreen? Thanks. Do you mind telling me which marble you used for your bathroom countertops? WOW your comment is COMPLETELY UNECESSARY.. AND YOU SHOULD LOOK AT YOURSELF FIRST, just shows how low you carry yourself. that robe is so pretty! Hi Rachel! You look beautiful! Your eyebrows look great as well, and I was wondering if you use a brow pencil of some sort? Thank you for your time, and hope to hear from you! I am an Esthetician and was curious if you have tried any cosmeceuticals for your skincare? You will discover that they are the best products for your skin and you actually won’t spend a fortune on them. It’s worth finding a highly recommended MediSpa in your area and a qualified Esthetician to recommend the right products for your skin type. Your skin looks flawless now but I’m sure you can benefit from using cosmeceuticals as they are the top of the line in the skin care industry. you will be a great author. I will make certain to bookmark your blog and will come back in the foreseeable future.